The North Central Catchment Management Authority (CMA) is carefully managing a series of key wetlands in the north of the state to both capitalise on the wet conditions and limit any damage from the recent floods. 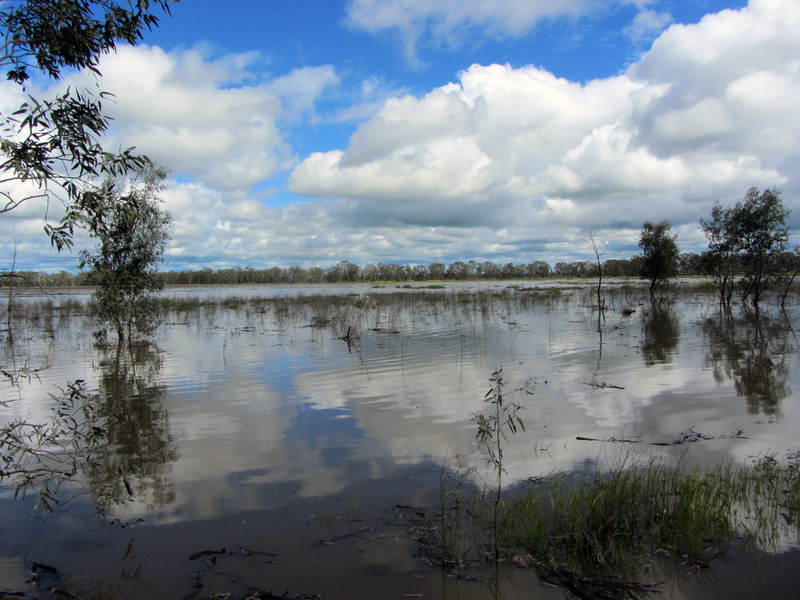 Heavy rains and high flows during September and October have naturally filled a number of Loddon River basin wetlands that are managed with environmental water, including Lake Boort, Lake Yando, Lake Leaghur and Lake Meran. A number of unregulated swamps such as Woolshed Swamp and Tragowel Swamp have also filled. However, changes to the landscape such as levee banks, roads and channels that have prevented any natural flows from reaching a number of wetlands in the region in the past, have also prevented floodwaters from entering them. "Environmental flows enable these wetlands to be managed as best we can within the irrigation system," North Central CMA Environmental Water Manager Louissa Rogers said. "There is much more to creating a healthy wetland than just adding water. Wetlands also need drying phases to allow soil to dry and plants to grow that will provide a food source for the boom when water is put in. "That is where things are at now. While there are floodwaters around, wetlands that will benefit from inundation will be watered, but we need to ensure any immediate watering will not impact them negatively. We also need to ensure there are flood mitigation options available to protect communities like Kerang. "Each year, the planning process around wetland waterings includes engaging with the community and interest groups. Seasonal watering plans are developed and include a range of options around different climate scenarios, including wet seasons. "Except where nature takes it out of our hands, all our decisions are in line with these plans. We plan for what we will do with environmental water in all conditions, drought through to extremely wet. We stick to the plans because they work." Ms Rogers said the North Central CMA had put a flow into Lake Cullen in recent weeks to take advantage of the floods. "An opportunity presented itself at Lake Cullen and we acted. Because of the way the water table works in with the surrounding marshes, the only time you can fill Lake Cullen is when the adjacent wetlands are soaked," she said. "Each year we develop plans to fill Lake Cullen if conditions are right, and they hardly eventuate. This year they have. The conditions are exactly as we need." However, Ms Rogers said not all wetlands will benefit from putting water in them now, and the North Central CMA will continue to manage them all within the agreed seasonal watering plans. "The situation is different for wetlands like Johnson Swamp and Little Lake Meran. Johnson was watered in 2015-16 and requires two years of drying to stop the spread of the invasive cumbungi," she said. "This will ensure the integrity of the diverse range of wetland habitats in the swamp is maintained for water birds and water fowl. "Little Lake Meran is another good example of why just adding water can sometimes be a bad thing. The wetland dried last summer, and will need another dry year to benefit from the previous years' waterings and prepare for the next one. "With disconnected wetlands, we manage to the plan because they very rarely get the natural wetting and drying that they need so we have to do it for them. "Hird Swamp is due for a partial fill in autumn, which will allow for it to have water in it for about 20 months. "If all the regional wetlands are filled at the same time, they will all dry about the same time, which will mean there will be a couple of years where there is no managed water in the landscape. Instead, staggering watering and staggering drying means the fauna will have constant access to water, which is particularly important if dry conditions return."